These little prints I designed are getting pretty popular in my Etsy store. It's Friday and and I thought what better then to have a little giveaway. All you have to do is go to my Etsy store and tell me which design(s) are your favorite by leaving a comment. Please be sure to leave an email address I can reach you at. The winner will have their choice to which print they would like to receive. The contest ends September 24th at midnight. The winner will be announced on Friday the 25th. Yay! I can't wait! Those prints are PRECIOUS! "spring branches" and "mod simple birth". Love the new designs! 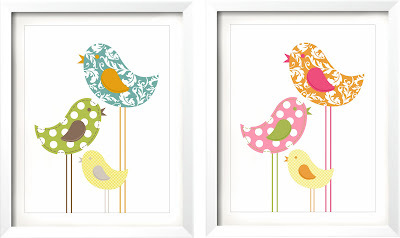 I love the decorative bird prints, little lamb, and girl bloom. You've got gorgeous works at your Etsy store! Little Burst and Hanging lantern are my favourite, can't seem to choose between them. Looking forward to seeing more great works of yours. We love the bird prints. My daughter's nursery has birds just like those! Thanks again for the wonderful custom invite! We can't wait to mail them.